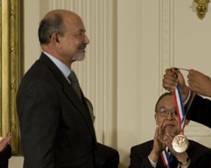 Jayant Baliga developed the equation for a wide bandgap semi-conductor at General Electric Co. (NYSE: GE), and it was the second big discovery he made there, after first developing a new kind of transistor. After developing that formula, his next stop was a professorship at N.C. State. “At N.C. State, we had the world’s leading program on widegap band materials and I wanted to work with a faculty developing these materials, so I set up a power semiconductor research center,” he explains. That’s where that nifty new formula came in, a formula he used to make the first wide bandgap semiconductors in the early 90s. “Since then, there has been tremendous interest around the globe, more than a dozen companies,” he says. The Wide bandgap semi-conductor uses 90% less energy than other semi-conductors and handles higher temperatures.